On Twitter, Scott Simon's Long Goodbye To His Mother : The Two-Way When Weekend Edition Saturday host Scott Simon documented his mother's final days on Twitter, the online community that is so often dismissed for being quintessentially banal embraced Scott's grief in a way we rarely see play out in public. Weekend Edition Saturday host Scott Simon documented his mother's final days to his more than 1.2 million Twitter followers. 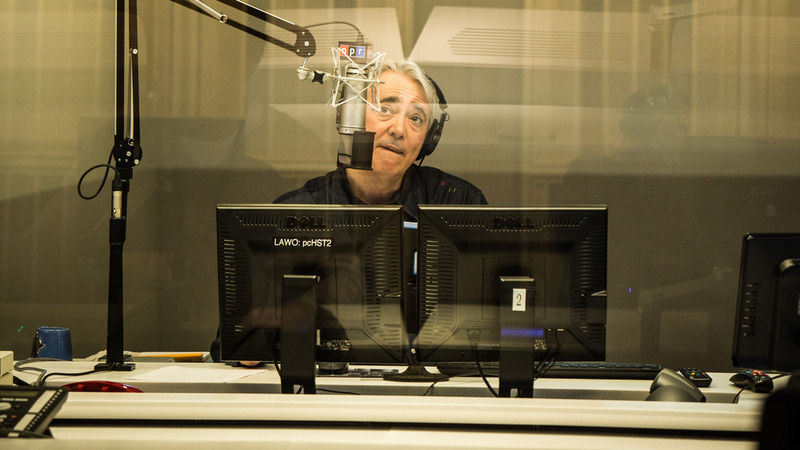 Fans of NPR's Weekend Edition Saturday no doubt noticed the absence of longtime host Scott Simon in recent weeks. What started as a well-earned vacation took a somber turn, as Scott told his Twitter followers on July 16 that his mother was in need of an emergency operation. "I can't talk. I'm surrounded by handsome men," he quoted her as saying while she was prepped for surgery. Patricia Lyons Simon Newman passed away Monday night, a month shy of her 85th birthday. It could have been a private moment between a mother, son and family, just as it almost always is for the vast majority of us. While we often share our grief with friends and colleagues after a loved one has passed and we've had some time to absorb our grief, Scott prepared himself by documenting his mother's final days on Twitter to his more than 1.2 million followers. And his tweets, some of them uncomfortably raw, struck a nerve. Fellow journalists, technology writers and countless others spent the past several days monitoring Twitter, hoping for the best but preparing for the worst. An online community that is so often dismissed for being quintessentially banal — think of the proverbial tweet of what someone had for breakfast — embraced Scott's grief in a way we rarely see play out in public. Scott says his last days with his mother were no less sacred because they were shared. Having lost my own mother after an 18-year battle with cancer this past February and as a colleague of Scott's who helped introduce him to Twitter more than five years ago, I found myself struck by Scott's honesty, humor and humanity as he tweeted the remaining days and hours he had with his mother. I remember those early days on Twitter when we sang its praises as something new and cool, but struggled to find the right words to capture what made the community so special. Today, all you need to do is look at Scott's Twitter timeline and the thousands of responses to her death for an object lesson in what true community is about. My friend @nprscottsimon is tweeting during his beloved mother's final illness. It is a remarkable and moving moment. Pay attention. Writer and online comic Tim Siedell, who has appeared on Scott's show to discuss Twitter and comedy, wrote that Scott's tweets were "heartbreaking, uplifting, human. Twitter has never been better." @nprscottsimon As someone going through the same process with my mother, I have nothing but admiration for your openness. Condolences. @nprscottsimon your post have the widow/er community cheering! We are proud of you.Face death head on with dignity and grace. @nprscottsimon I missed my 102 yo grandma's passing by 15 mins. My heart aches for you and your loss. Surround yourself with love. The death of Scott's mother continues to reverberate across social media. It's not every day we have a chance to discuss openly dying with dignity after a life well lived. For that, we offer our condolences to Scott, and our gratitude for sharing her story with us. Below is a collection of some of Scott's tweets sent out over the past two weeks, beginning with the announcement that his mother needed surgery.